The weans just won’t sit still! ‘The weans just won’t sit still!’ Despite the lure of thruppence for the cinema or a new comic to read Joan’s young models found it difficult to hold a pose for long. She had to work fast and if you have ever tried to draw your children or your grandchildren you will understand the challenges Joan faced trying to capture a fleeting expression or a shy smile. 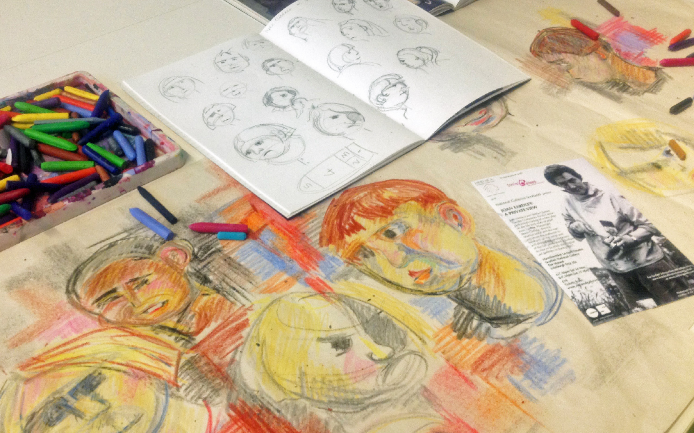 Join artists from The Thrive Archive for a 90-minute workshop ‘After Eardley’ and explore the joy of drawing portraits of children at speed. Simply bring a photo of a ‘wee one’ to inspire you and an old shirt or apron to wear. The 90-minute workshops are free and we provide all the materials. There are 15 places available and they are filling up fast. The Thrive Archive is a creative community research project set up by collaborative artist Jan Bee Brown with story at its heart.